Sara Runs This Weigh: SEVEN miles!!! It may not have been my fastest average time, but look at that distance! SEVEN miles! WOW! That's the furthest I've ever gone in my whole life at one time. I am all but 100% sure that they never made me run more than 5 miles at a time in the Army. I had just passed the 2.5 mile mark and started to toy with the idea of going to 3.5 miles instead of 3.1 for my turn around and try for a personal best of 7 miles. I figured that if I felt like it was too much, when I go to my originally planned 6.2 miles I would just stop and walk (yeah right, like that was going to to happen). I think just giving myself that out and permission to stop if I felt I needed to was all I needed to give myself the oomph to finish the 7 miles. And I have no doubt that I can take it even further. This means I am only 6.1 miles away from doing a 1/2 marathon distance! OMG! that is awesome! Congratulations. 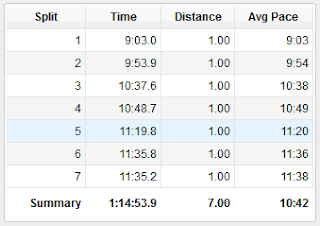 I looked at your splits, if you slow down does first couple miles, you are likely to have a better place overall.going out to fast, usually makes you slower overall. 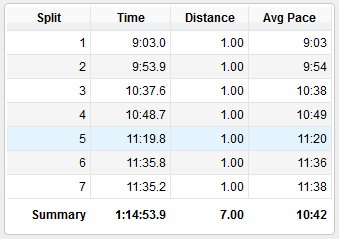 Given your splits, if it were me I would shoot for 10:30 minute miles in the beginning (maybe even 10:45) for these longer runs. Then, if you have the energy, you can pick up the pace in the second half of your run. I think you will find you will have faster times overall doing it this way. This is what's great about having a Garmin. Great job! Thanks! I'll definitely make a point to try and slow down my first couple miles. I was wondering how to have more energy later in my runs...don't know why this hadn't occurred to me....hahaha!